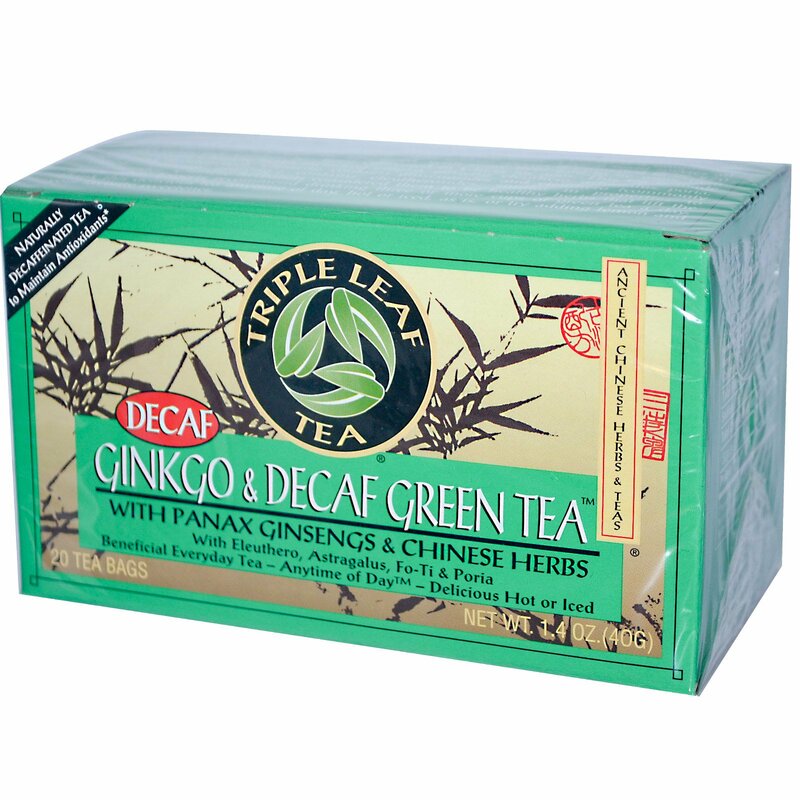 Now you can enjoy the benefits of ginkgo, green tea and Chinese herbs without the caffeine! Our green tea is naturally decaffeinated using a carbon dioxide process that maintains green tea's beneficial antioxidants. Ginkgo biloba is a unique tree species with no close living relatives. It is a living fossil. Living fossil species all have survived major extinction events. The ginkgo species is estimated to be 270 million years old. Ginkgos are long-lived, with some trees said to be more than 2,500 years old. Ginkgo has been cultivated in China for ages. This tea is made from revered Chinese herbs including gingko, ginseng, eleuthero, astragalus, poria, fo-ti and licorice root. 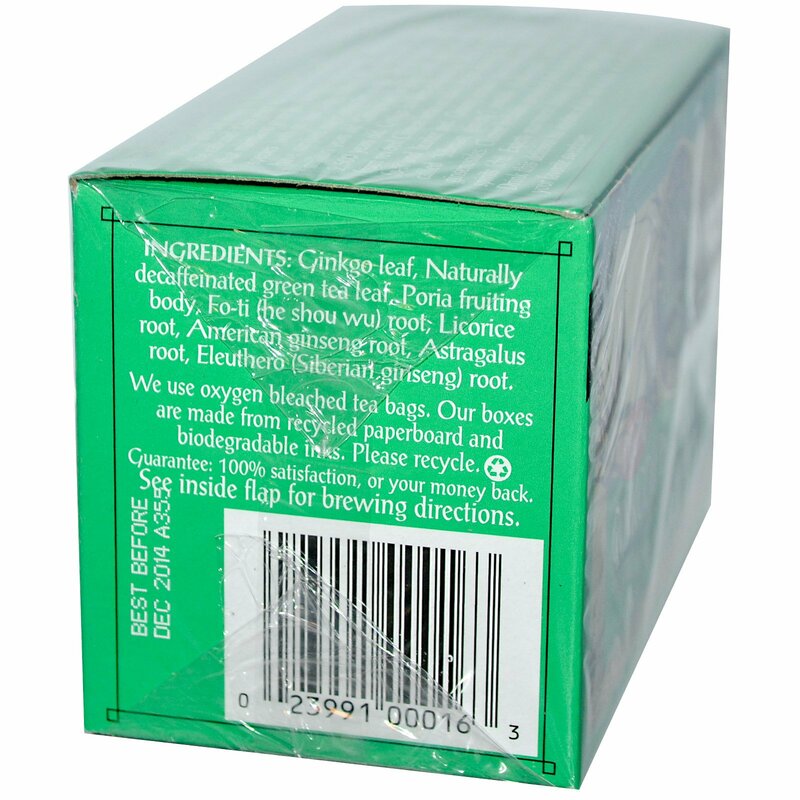 Ginseng contains ginsenosides and eleuthero (commonly called "Siberian ginseng") contains eleutherosides, similar in properties to ginsenosides. Chinese herbalists considered them to be healthy herbs that lift the spirits (chi). Experts recommend drinking three or more cups of green tea a day. Drink this delicious tea anytime of day, hot or iced, as is, or try adding lemon and your favorite sweetener. Ginkgo leaf, naturally decaffeinated green tea leaf, poria fruiting body, fo-ti (he shou wu) root, astragalus root, eleuthero (siberian ginseng) root.